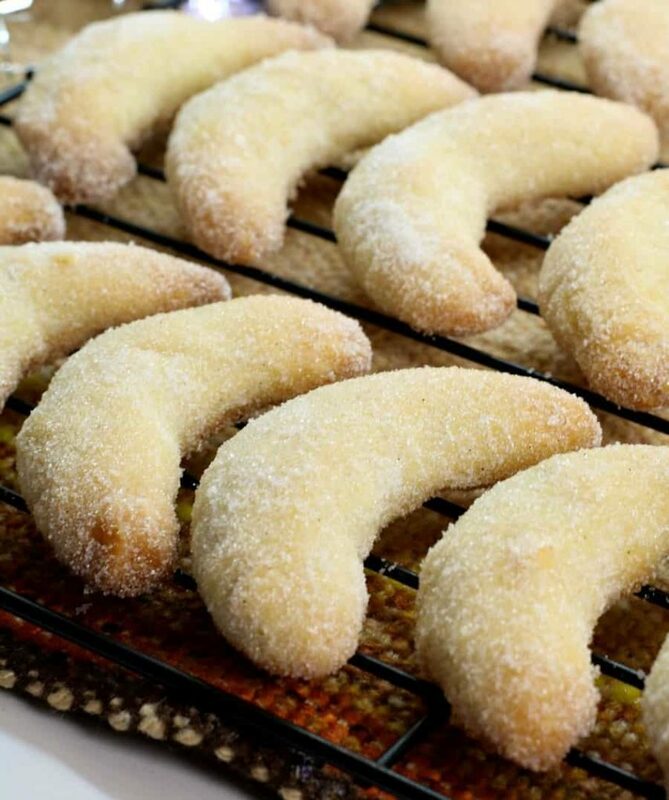 Vanillekipferl (German vanilla crescent cookies), are a shortbread like cookie common throughout Austria, Germany, Switzerland and Hungary. Made with just almonds, flour, butter and vanilla sugar, these cookies are very easy to prepare. 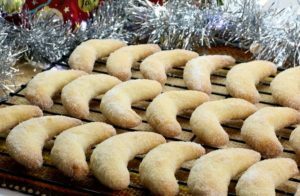 In Germany, vanillekipferl cookies are most commonly made during the advent season and are ideal for cookie exchanges. The holidays are one of my favorite times of the year. Between spending time with family and friends, cooking and baking good food, and decorating our homes, family traditions are what really make this time of year special. My favorite family tradition was baking Christmas cookies. Which is why I started this series on my favorite holiday cookies and sweets. 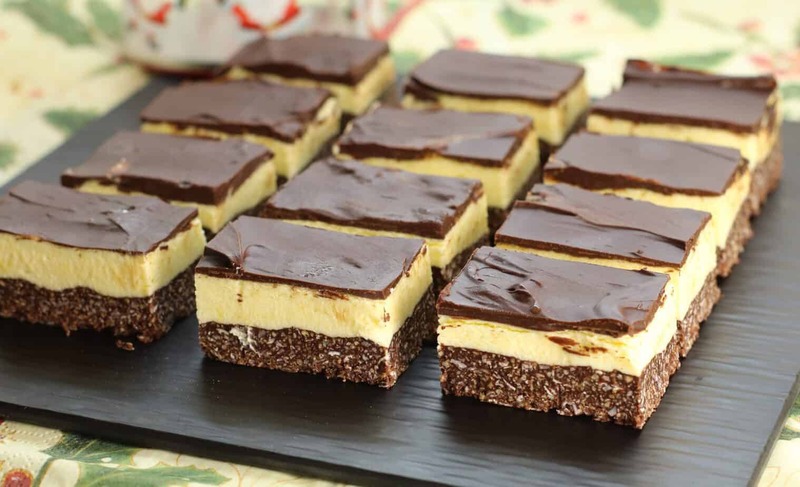 So make sure to try my Hazelnut Meringue cookies, traditional shortbread cookies, as well as these Canadian Nanaimo Bars! You’ll notice the recipe is all in grams, this is intentional, because for some reason, the vanillekipferl just don’t turn out when the ingredients are measured by volume. For best results make sure to weigh everything! What I love about cookies recipes is, that for the most part they are dead simple. No elaborate instructions or skill set needed, and these delicious little vanillekipferl cookies are no different. Begin by pre-heating your oven to 400F. Mix the ground almonds, flour, and sugar in a bowl until everything is nicely mixed. If you can’t find ground almonds in the store, you can use sliced or whole almonds and grind them in a food processor. I used my handy Nutri Ninja Blender(affiliate link) to do this. Once you have all the dry ingredients mixed, dice up the cold butter. Using your hands, break it up in the flour mixture until it starts getting crumbly, just like if you where making pie dough at home. Keep mixing in the butter until the dough starts sticking together and you can form a round ball with it. Take the ball of dough, and using the palms of your hand, roll out a 4 cm thick log. If the dough crumbles and doesn’t want to roll out, knead it a little with your hands to get it to hold together. If the dough starts sticking on the cutting board or counter while rolling, dust the surface with a little flour. Butter a cookie sheet or line it with parchment paper. Continue by cutting the 4cm thick log into 1cm thick slices. Set these off to the side. Take the 1cm thick slices of dough and cut them in half to create evenly sized sections. 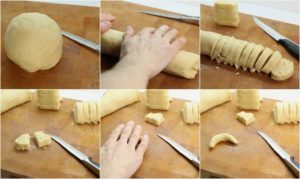 Using the palm of your hand roll out each individual piece until you have a little sausage shaped roll about the length of your index finger or 6cm. Curve this into a crescent shape and place on the cookie sheet. Evenly space out the vanillekipferl cookies on the cookie sheet. Once the tray is full, place them in the oven to bake at 400F for about 8 to 10 minutes. The actual time may vary slightly depending on your oven. Once the cookies come out of the oven they may still be a little soft and prone to breaking. Leave them for about 60 seconds and then, while still hot, toss the cookies in a bowl with the vanilla sugar. Since the cookies are still hot they sugar will stick to the vanillekipferl creating a wonderfully sweet coating. Cool the cookies on a wire rack and then store them in a sealed cookie jar or tin. The vanillekipferl cookies will keep for 1 to 2 weeks before starting to go stale. A light shortbread like almond and vanilla cookie, perfect during the holidays. 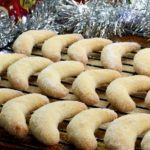 A traditional German christmas cookie, vanillekipferl are perfect for cookie exchanges! 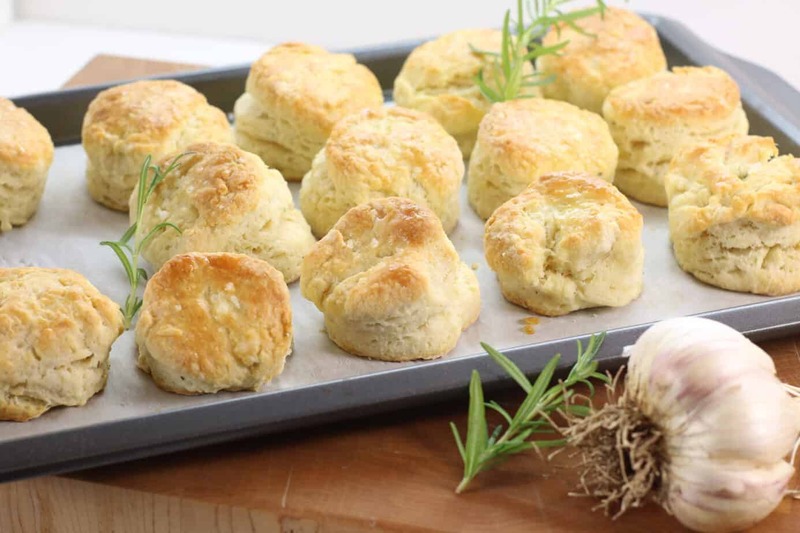 Pre-heat your oven to 400F, and butter a cookie sheet or line one with parchment paper. In a bowl mix together the flour, sugar, and ground almonds. Dice the butter and using your hands mix the cold butter into the flour and almond mix. 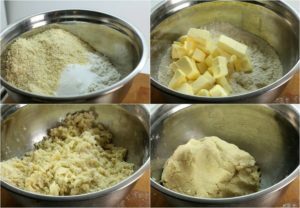 Keep mixing the butter in by crumbling it with your hands until the dough starts to stick together and forms a ball. Roll out the dough into a 4 cm thick log using your hands. ( If the dough is very crumbly knead it a little longer). Cut this log into 1cm thick slices and set the slices aside. Take a slice of the dough and cut it in half again. Roll each half into a little sausage shape. 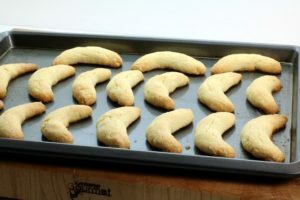 Curve each mini roll into a half moon shape to make the individual cookies. Place the individual vanillekipferl cookies on the greased cookie sheet and bake for 8 to 10 minutes at 400F until the vanillekipferl cookies start to brown ever so slightly. The cookies may still be slightly soft when removing from the oven. Let cool for 60 seconds and then toss the still warm cookies in the 1 cup of vanilla sugar. You can freeze them after baking, of course they are never as good as when they are fresh! I store mine in an airtight cookie jar or tin! Thank you. I’ve tried them before and loved them but I’m making several batches to take to hospital staff and wanted to know if I could freeze them. Can I just freeze the logs and cut them later. By the way, these are awesome. Thanks for sharing these! I can never say no to German recipes… considering that my husband is half German, German recipes are quite under-represented in our home. These look lovely and so simple! I love these cookies ! I learned to make them in a pastry class before and it’s so fun. I love vanilla sugar too ! I add it to almost everything ! Thanks for sharing ! Awesome! Where did you take the pastry class? These remind me of cookies my oma used to make for us when we were kids! I should have to try them on my own! They are so easy to make Melissa! Give it a shot and let me know how it turns out! Anything German and Christmas makes me happy. Except Marzipan, unless it’s in Stollen. I will have to try these. Fröhe Weihnachten! Frohe Weihnachten! You don’t like marzipan? O man I could eat it raw. My favourite marzipan is sold in bar form and wrapped around a core of nougat!